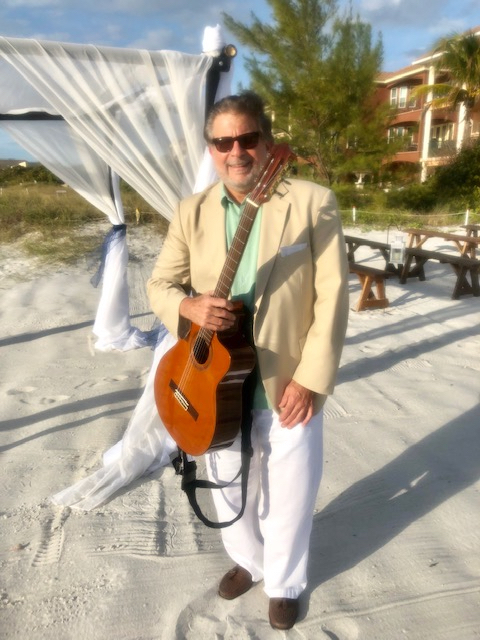 This past Sunday, I played for a Breathtaking St. Pete Destination Beach Wedding. The Lions Club served as the picturesque venue. The bride and groom selected me to play cocktail hour music. This began immediately after their ceremony. They wanted a variety of styes so I chose classical guitar music, traditional jazz guitar standards and popular guitar music. I even played some original tunes. I loved the opportunity of this performance. I’m up for the challenge of playing music for a group from age 8 to 80 because I started playing guitar at age 12 and I’m now in my 60s. Standard jazz guitar tunes like Girl from Ipanema work perfectly. I could even hear some of the guests singing along with the music. You can always count on music from The Beatles like Norwegian Wood to be a hit with the crowd. And for The Great American Songbook lover, Fly Me to The Moon is the perfect choice. This breathtaking St. Pete destination Beach wedding was extraordinary because the weather was perfect and the wedding planner, Amber Jacks, from Simple Weddings Treasure Island Florida did an amazing job!